A day will eventually come when you will be stirred by unexpected events. Your Soul has been praying considerably for this day without your conscious knowledge. On this day a big part of you will die and you will begin to search for the magical elixir that will bring you back to life. You will seek the potion in your external world with friends, lovers, enemies, books, religions, heroes, even your job. But no matter where you look the treasure chest that holds the key to revive your deadened life will evade you, the numbness is now unbearable. All will seem lost and the inevitable may seem apparent, you will lose all hope that this magic potion even exits. This will be the darkest of nights the most shadowy dusk you have ever been a witness to before and the promise of certain death will head you into the abyss of despair. Your Soul has been gasping for its last breath for most of your life, you have been exposed to a poisonous energy that has taken its weary tole. As you soar uncontrollably into the abyss you are given a glimpse of the dim light of your soul, and you see clearly there is still a drop of life in you. You ask the Universe for enough radiance so you may transform the abyss into the elusive potion so to save your existence. So it may be and for the first time in forever, you realize that all the while it has been your own illuminated light, your innocent aurora that you have been searching for all along. Your Soul’s request has been answered and the dawn of a new day has been granted. Your will to live has far exceeded the throws of the abyss, now your work begins. A new employment is granted where your efforts will be invested in yourself and not someone else, a true labour of love, you are to be of service only to your own Soul from this day forward. You will never have to compromise, forget or discard yourself ever again. The single drop of life which was all that was left in you has swelled into a thousand rainstorms, enough to fill the oceans of the world. No longer will you feel despair, no longer will you feel unworthy and no longer will you feel the need to please another human being other than yourself. 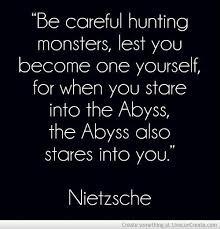 Your only hope now is you may be given the opportunity to teach other Beings how to avoid the abyss as well. You pray to the Universe for the masses to come. Your compassion is overflowing into the world which makes you feel so ALIVE.